More friends and a blog: Corn on the cob, corn salad, corn everything!! Corn on the cob, corn salad, corn everything!! This salad was part of our dinner tonight, it is based on a recipe that a friend gave me. ( I think it is pretty close to the original but I couldn't find the recipe -K and S I can hear your snorts of laughter at that "based on" ). My husband stopped on his way home and picked some corn and jalapenos from a friend's garden. I added two avocados, two tomatoes from the garden, and some onion to a jalapeno and about four cobs of lightly cooked corn. I made a dressing out of balsamic vinegar, olive oil, lime juice, fresh garlic, salt and pepper and then we topped it all off with a few shakes of Frank's hot sauce. Yum!! 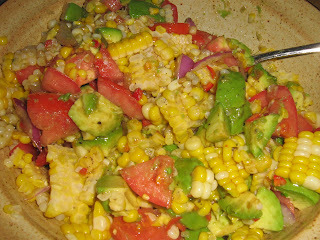 My father-in-law LOVED that corn/tomato/avocado salad when they were visiting last year! I can't remember the exact ingredients I used, but your recipe is close!! !